Elephant Garlic | Henry Field's Seed & Nursery Co. Impressive size! Elephant looks like garlic and tastes like a mild hardneck type, but it is actually a type of leek. Plump, 1 1/2-in. 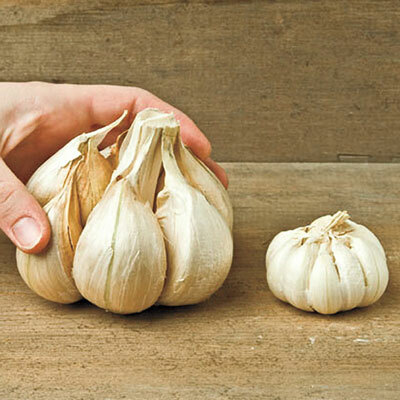 cloves have delicious, mild garlic-like flavor; bulbs commonly weigh a pound or more. Very easy peeling and keeps very well. Averages 10 cloves per bulb. Zone 3 - 9 (-30° F.) Annual. Height 4 - 5 inches. For each offer ordered, get 1 bulb. Height: 4 - 5 inches. Spacing: 4 inches between plants; 8 - 24 inches between rows. Days To Maturity: 120 days. Soil Requirements: Loose, organic, well-drained soil. Size: 3 - 4 inches. Fruit: Each bulb averages 10 huge cloves. Big, but mild.